My mother designed her life to be filled with meaningful rituals. Those personal rituals became as much a part of who my mom was as her genuine appreciation for life and her nickname, Mickey. My father was in the Air Force and so my parents moved around more than most young couples. 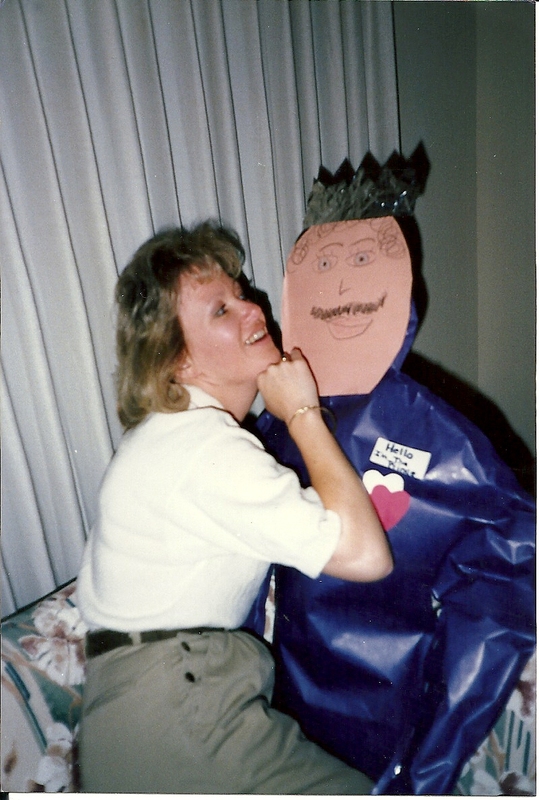 To say my mother was a people person is a serious understatement so you might imagine how difficult it was for her to repeatedly say good-bye to friends. Those were the days when long distance phone calls were quite expensive and e-mails were nonexistent. So, to stay in touch, my mother took up the task of letter writing. That undertaking (she would have never called it a task) became her letter writing ritual. This writing ritual began before I was born. By the time I was old enough to really comprehend the level of her of commitment, she had been writing for over twenty years. It took two address books to hold all of her friend’s addresses and a small date book to keep track of the daily correspondence. Each day, she would find time to sit, coffee in hand, surrounded by her stationary, note cards, and fancy address labels, and write to those people who meant so much to her. She sent joyful wishes, notes of sympathy, thoughts of encouragement, and holiday greetings. If an occasion had meaning for a friend, it had meaning for my mom and she sent her thoughts in a card. She relied on her Birthday Book to make sure no one’s special days were overlooked but she had spent so many years and so much time acknowledging those special days, that many of them were imbedded in her memory. 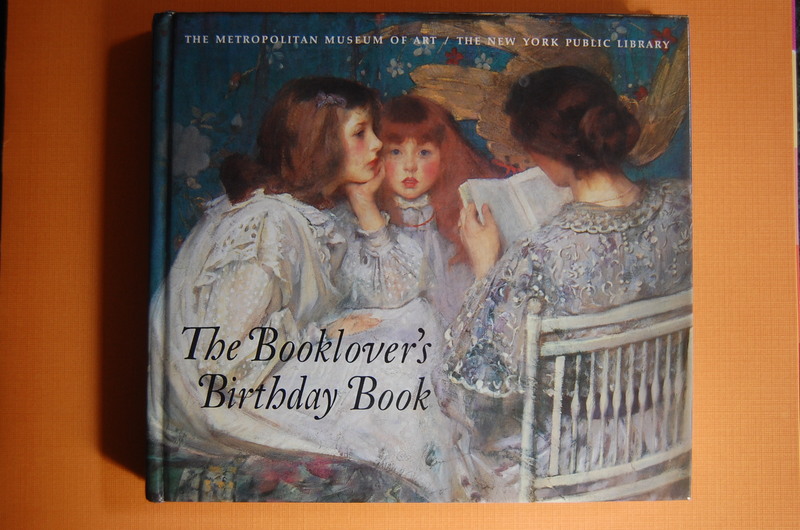 The book my mom used to record birthdays, anniversaries, etc. What had started as a simple way to stay in touch with long distance friends had turned into a personal and unique way of reminding friends, near and far, of their importance in her life. And in doing that, it had also allowed her to live a part of her life,everyday, dedicated to one of the values she held closest to her heart, the value of friendship. It’s no wonder that it brought her such joy. It was June and my teaching buddies and I were looking forward to vacation but lamenting the fact that we never seemed to do a good job of getting together over the summer. Someone suggested that we schedule a round of golf every week and whoever was in town could just show up. The idea met with unanimous approval which was pretty amazing considering there were ten people voting and only a couple of us had ever actually held a golf club. We decided we would find a small, local golf course and we would play late in the afternoon so our amateur skills would offend as few people, as possible. Birch Hills Golf Course, a small executive course near the school, turned out to be our summer playground for golfing and we became acquainted with Mike, the golf pro, on our first visit. Judy had called ahead to set a tee-time and explain our situation before the first time we actually played a round of golf. At first, Mike was the consummate professional explaining exactly what the club offered in classes, equipment, and support. However, it didn’t take him long to realize this group of golfers was more interested in the color of their tees and who would drive the golf cart than in signing up for classes to improve their putting. The rules, for the course, were painted on a wooden sign that hung on the outside of the door to the pro shop and were quite obvious. Teachers are basically “compliant children” so Mike didn’t need to worry too much about us breaking the rules. We did sometimes giggle a little too loud, allow ourselves an inordinate amount of do-overs, or stop too many times to take photos. Our golf game might have been a bit unorthodox and we might have bent a few rules but we never broke any rules that could result in anyone getting hurt and we were never disrespectful of the more skilled serious players. The Marshall, who drove around in his little cart watching for infractions, disliked the fact that we would sometimes bunch together and make a six-some. 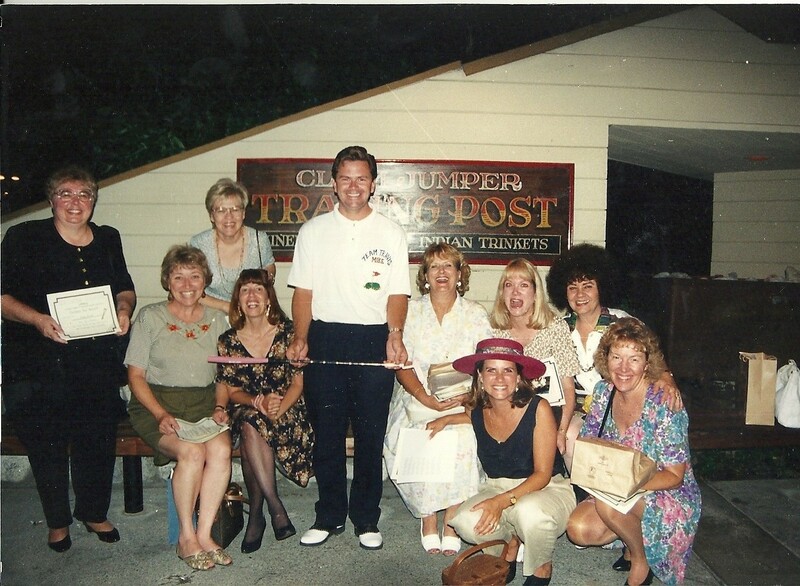 He would always drive up to the group and exclaim…”Ladies, the rules state that you golf in groups of 4.” He must have complained, back at the pro shop, because once Mike made Judy walk outside and reread the rules posted on the door. But before the end of the summer Marshall had become our “best friend” and would purposely go out of his way to stop by and say hi whenever his shift was ending just as we arrived. As the dog days of summer drew to a close, we faced the beginning of a new school year and the ending of those regularly scheduled golf games. Our weekly tee-offs had provided us with fun, friendship and a modicum of exercise. No one wanted to see them come to an end. We decided to stretch out our time together and end our summer routine with our own personally created Sports Award Banquet. We chose categories of awards where we would recognize each other for the unique strengths we each brought to the game or the growth that we all demonstrated. It would be the culminating activity after a summer of fun and new learning. We made reservations at a local restaurant, invited Mike to join us, and set out to create voting ballots for those awards. Tomorrow I will post my poem…Twas The Night Before Golfing. Thank you Clement Clarke Moore. Nightclubs like the Hollywood Palladium, The Cocoanut Grove, and The Copacoabana were a huge part of night life in the 1940s. Even most large hotels had restaurants with their own orchestras. Camera girls meandered through the crowds as the guests danced and dined. These photographs were then available for purchase and would be delivered to your table, in a souvenir folder. 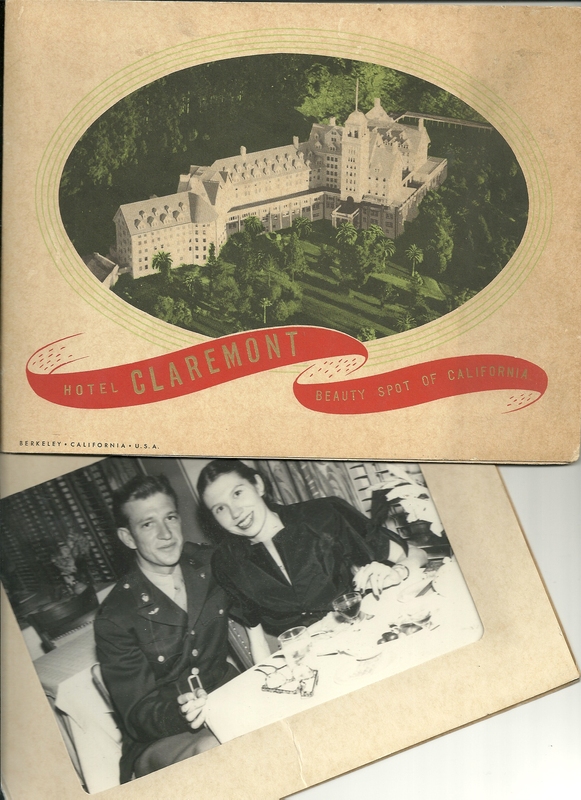 This photograph, of my parents, was taken at the Hotel Claremont in Berkeley, California, in 1949. My parents really are the inspiration for my blog. It was their devotion to each other and their commitment to living life to its fullest that prompted the creation of their traditions of celebration. Those celebrations enriched my life, as a child, and have continued to influence me and the design of my own celebrations of life, as an adult. My story begins with them. Most wedding ceremonies last for about an hour. Add a sit down dinner reception and the celebration will last for several hours. Decide to invite your guests to a romantic setting where everyone stays in small cottages and the celebration lasts throughout the week-end (I actually know of someone who did just that) and you might get 72 hours of wedding celebration. But I think that I am safe in saying that whatever the length of the celebration, it pales in comparison to the time spent planning for the special day. Brides-to-be spend hours preparing. They try on dresses, taste entrées, make music selections. All the hours spent in the prep can be exhausting and frustrating but those hours can also be sources of some amazing memories. A photographer, hired to record the special moments of the wedding day, is considered a necessity. But what happens to all of those special moments that occurred during those numerous planning days? They get filed away and too often (I fear) forgotten. Yet they are the very moments that help to make the big day such a magical event. What I am about to propose (no pun intended) is that there could be someone who records some of those special wedding prep moments – someone who becomes a memory-keeper for the bride. And that someone could be you. This job is designed for someone who is close enough to the bride to naturally be included in much of the planning. It doesn’t mean you actually have to be with her everywhere she goes for wedding prep but it assumes you are close enough to the bride that she will be sharing her big-day planning experiences with you on a somewhat regular basis. It assumes you’re willing to keep little notes on the events as they occur and willing to keep a temporary secret. And most importantly, you think it sounds like fun! Get yourself a small, basic notebook. It should fit easily into your purse or pocket. It shouldn’t be fancy. Resist the temptation to buy something that might invite you to focus on something other than just recording facts. Don’t worry about what you write – just write. There will be a chance, later on, to rewrite entries if you decide. Save the descriptive phrases and fancy verbs for then. You are not going to be lurking in dark places with your notebook. In fact, you don’t really have to keep what you are doing a secret. You’ll see why I think it’s fun to keep it a secret later in the blog. As you become privy to information, date and record it in your notebook. I am assuming that, if you are choosing to try this activity, you know the bride fairly well. Record facts that you feel will be meaningful to her. Be kind. If something happens that might be considered embarrassing, exercise good judgment. You know the bride so you are best to make that distinction. What memories do I keep? Some of the memories that are perfect to “keep” will be obvious. A mother-of-the-bride getting teary when she first sees her daughter, in a wedding gown, might be predictable. The words she uses to express her feelings will be personally unique and meaningful. They might even hold some surprises. When the florist, who has been working with ten other clients that day, calls the bride by the wrong name, it might be annoying at the time but it could be funny, later. As you go along, you’ll recognize the opportunities where you should record a fact. Regardless of what you do or don’t choose, you really can’t do this job incorrectly. Let your genuine love and friendship, for the bride, guide your choices. What do I do with these collected memories? Think of times and places where it might be fun to use these bits of trivia. How about a bridal shower? We’ve all been there. It’s the chatter that goes on, between guests, while playing those shower games that makes them fun. 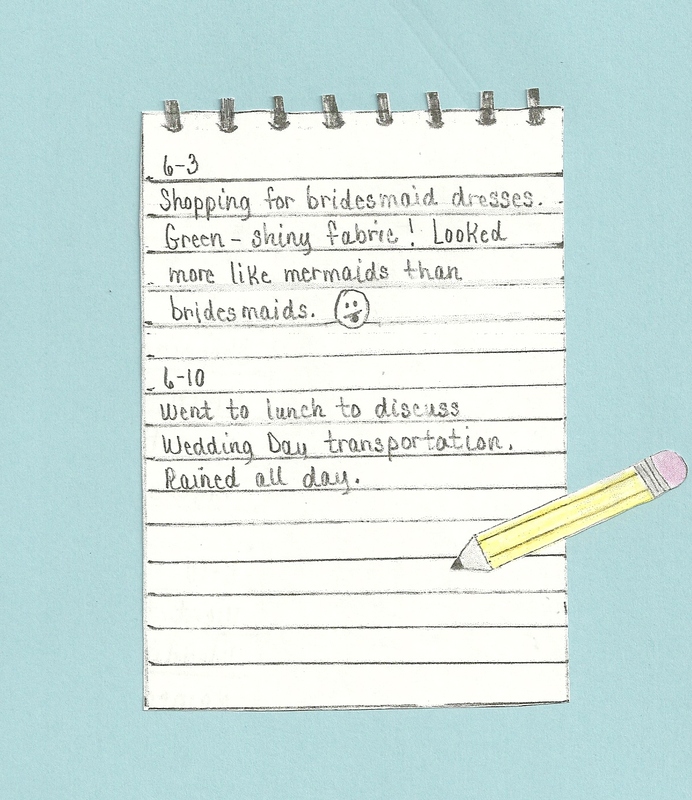 Bride Bingo, without it, can be down-right painful. 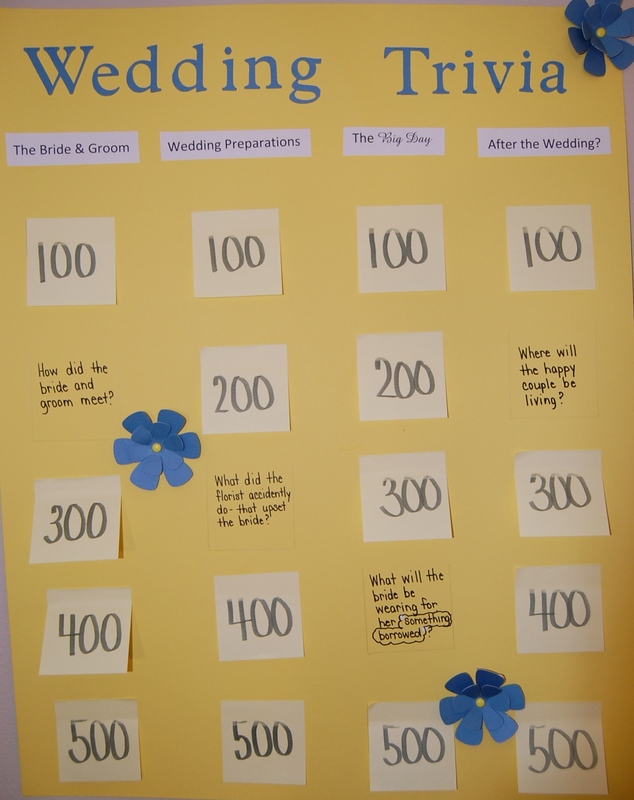 Try the challenge of turning bits of information about the wedding and your unique memories into a game. You could divide your memories into categories and have party guests try to answer easy 100 point questions or be challenged by those 500 point questions. Obviously, only a few people may know the name that the florist accidentally used when conferring with the bride, but it will make for fun conversation. Typically, the bride knows all of the answers to any bridal game question. But even she may have to search her memory for some of these answers. If you have kept your memory keeping a secret, these little facts will be a fun surprise, for the bride, as well as the guests. Responsible for a wedding toast? Your memories might provide just the additional anecdote, funny or sentimental, that you were looking for to complete that toast. You can eventually turn your notes into a gift. At this point, you might purchase or make a little book that is a bit more decorative and rewrite some or all of your entries. If you feel comfortable adding those descriptive phrases and fancy verbs, now is the time. I personally feel that the memories themselves are special enough but that is up to you. This little book of memories could be a Happy First Anniversary Gift. I think that you will find, while collecting all of these memories, it has made the planning steps more meaningful and more enjoyable for you. That’s a perk right there! Celebrating a friend’s wedding day is incredibly special. Celebrating a friend’s preparation for that day, by being a keeper of the memories, is a once-in-a-lifetime experience that will stay, with both of you, forever. I have been a memory keeper, myself, but I was recording for another unique event. If you have questions or would like a little additional help, please feel free to ask. If you decide to “become a memory keeper”, I’d love to hear about your experiences. Celebrations naturally accompany friendships so I guess you might say Kim and I have experienced over 30 years of shared celebrations. 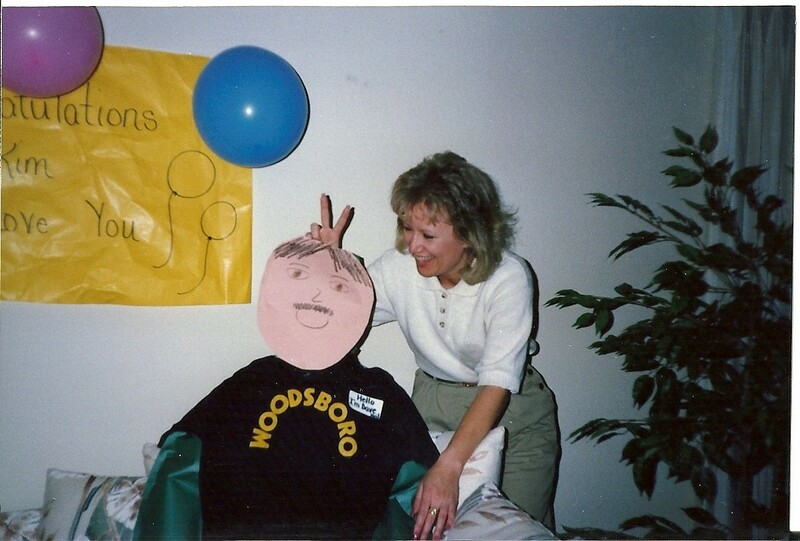 We became buddies in the earliest years of our teaching careers and recently joined the ranks of the retired. Still friends – but after all those years – more like sisters than buddies. June is the month of brides and all things wedding. It seems fitting that a June blog, on celebrations, should be about a wedding related celebration. This story is over 20 years old but it still makes me smile to retell it. Kim had announced that she was getting married and I wanted to give her a Bachelorette Party. I wanted it to be an evening with lots of time for sharing but I also wanted a bit of tradition. Somehow guys had to be a part of the equation even though the classic evening with a gang of girl-friends and a male-stripper just wasn’t the right fit. Trying to think of an idea that compliments occasion is always fun for me. It’s a bit like putting puzzle pieces together. I decided the first part of the evening, and the most lengthy, should be with just the two of us. Somehow I would add the “man” touch at the end of the night. The pieces of the puzzle finally came together. I needed something like those life-sized cut-outs of movie stars you see in a video store advertising the newest movie release. But, I didn’t really want movie stars. I wanted guys that had been a part of our lives. I would have to make them myself! The men needed to be life-sized and dimensional. 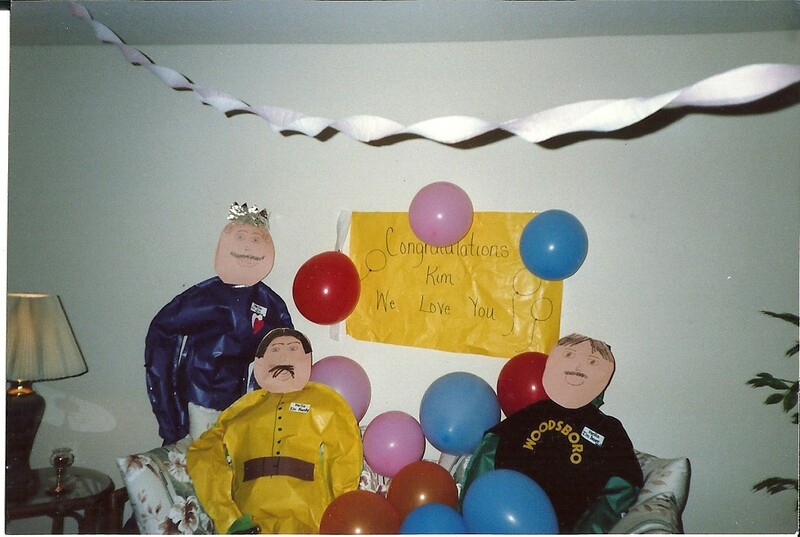 I ended up creating something like large puffy paper dolls. Discarded sheets of butcher paper, previously used to cover classroom bulletin boards, are easy to come by in a school setting. I knew my choice of colors would be limited to the primary colors typically found in a classroom but they could serve as bodies and clothing. I’d have to make faces out of something closer to skin color. I needed a body template so I asked a friend, who was sworn to secrecy, to take home one large sheet and trace her husband. From that template, I traced twelve bodies to be the fronts and backs of six men. For several nights, I spent my evenings stapling the sides of the paper bodies,adding the torn newspaper as stuffing, then stapling the opposite side to seal the paper doll body. As I stapled and stuffed, I ran through years of memories to determine just who would be in attendance that night. I wanted the men, in attendance, to be somewhat representative of the experiences of our friendship as single women. Our first principal, Dave, needed to be there. I remembered him with a big smile and a genuine concern for children. He had a dream of owning a pet store specializing in birds. I wished I’d had a parrot for his shoulder but I settled on a t-shirt from the school where we had first taught together. Steven and Joe represented our twenty-something years. The dating scene needed to receive some recognition. The four of us had gone on a skiing date. I knew I could dig out my old skis and poles. The guys provided memories. 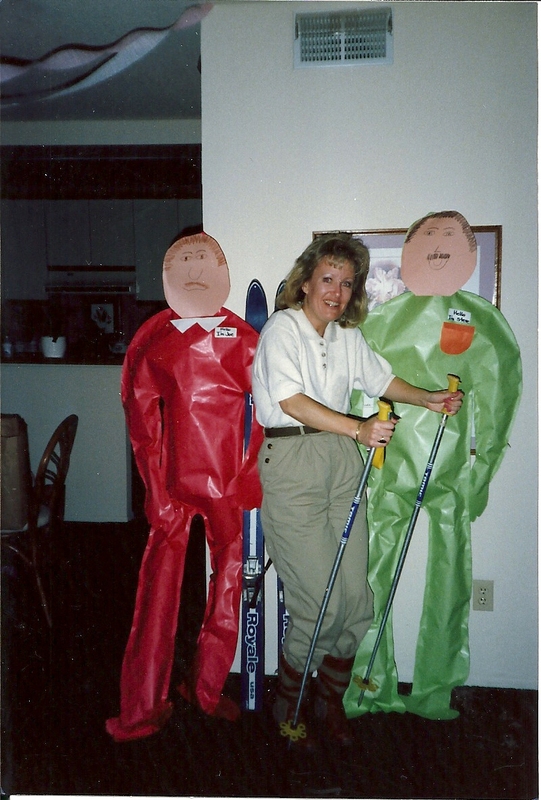 The ski gear served as decoration. Ramon, her fiance, had to be in attendance. I gave him a little crown. He isn’t really the crown type but it added to the ridiculousness of the whole evening. When I was done, there were six guests in all. 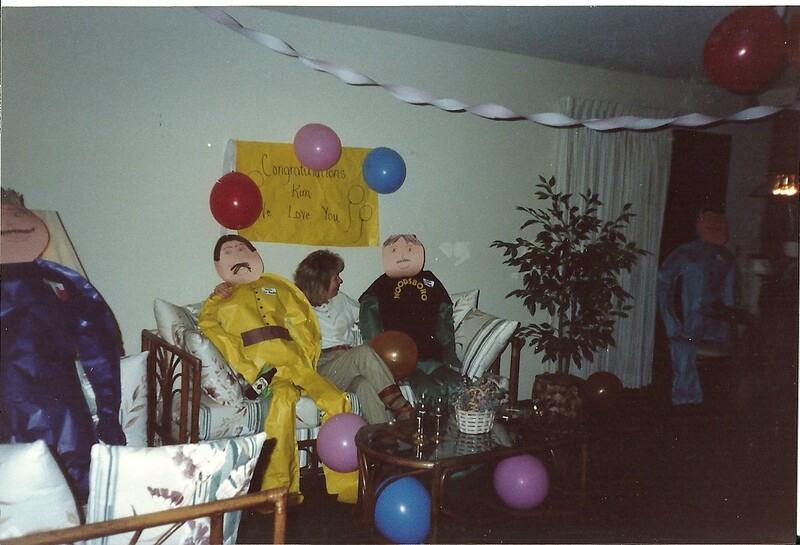 A little crepe paper and a few balloons and we were ready to party. 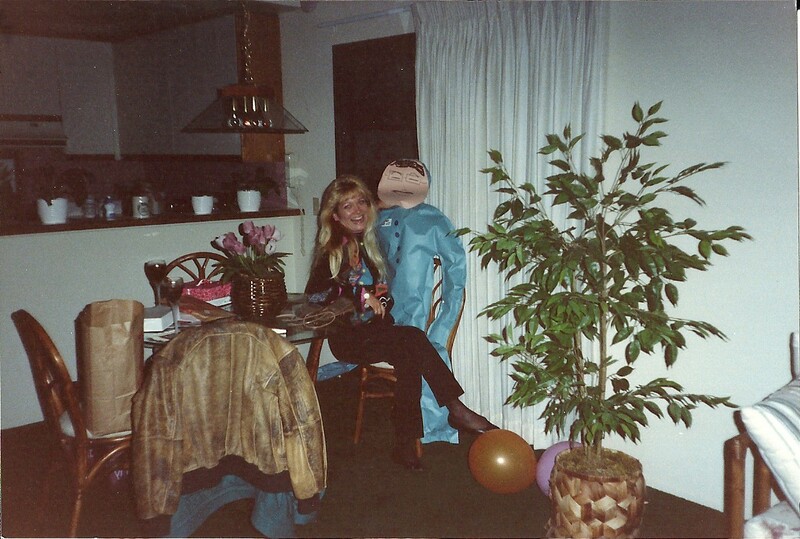 The night of the party Kim came to pick me up. I purposely told her that I would just walk out to the car so we’d have as much time at dinner as possible. Combine friends and food and time always goes by quickly. We never seem to have enough time to just talk, anyway. I was excited about going back to the condo for the surprise but as we got closer I began to suffer tha pangs of self-doubt. Was this ideas a little creative, albeit silly, or just plain stupid? What if Kim didn’t get the meaning of all of it? But I was in too deep at this point and one of the reasons that Kim is such a good friend is the she “gets” me. I felt certain she would recognize that I planned this goofy party out of love and genuine happiness for her impending wedding. As we approached the front door, I purposely started to talk just a bit louder than normal and faked fumbling at the door lock. I could tell Kim recognized the awkwardness of the moment. But I just opened the door and motioned her inside. As she stepped in, I shouted “surprise” with all the enthusiasm of a hostess with fifty waiting guests. Then I stood there, frozen, in anticipation of her reaction. I’m sure Kim was confused for a moment before it all made sense. I don’t remember exactly how it all happened but the next thing I knew we were both laughing and I was retelling the whole planning of the evening. Kim was working her way around to all of the guests as I snapped photos. We laughed and talked and reminisced about all the crazy things we had done over the years. When the evening was over we loaded all of the men into her car, waved good-bye and they drove away. The image of her Jeep Cherokee packed with six paper-stuffed men is etched in my mind forever. Why I didn’t take of picture of that, I’ll never know! Kim’s Bachelorette Party was over. We had celebrated our friendship and where it had been and we had celebrated Kim’s life and where it was going. Life goes by so quickly and friendships are so valuable. We had taken a small moment in time and made it into an event – a celebration. For me…that’s always the appropriate thing to do.